The Ulytau are great Mountains, the historical center of the Kazakh people, and the culture epicenter of nomadic steppe civilization. The greatness of these mountains is contained in the significance of significant events in Kazakz history which occurred here, connected with the unification of the Kazakh Zhuzes (tribes). 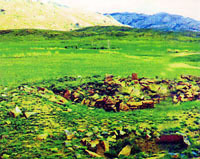 Ulytau was the favorite place of the nomadic tribe Khans: Joshi Khan, the eldest of Chingiz Khan's sons, had his headquarters here, and the younger Batye started his march to the East from this area. 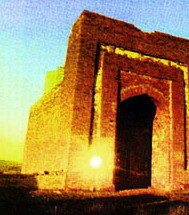 Located here are the Joshi Khan mausoleum, the Kultuk-Temir, Bolgan-ana, and Kelyn-tanvs mazars, and the Tokhamysh Ordas Khan mausoleum over Alash Khan's grave, who was one of the Turkic tribes' founders. Edige, the great military leader, amir of golden Orda, whose name is mentioned in the epics of the Altai, Ural, Northern Caucasian, Crimean, and Uzbek peoples, has remained forever in the Ulytau Mountains. The great Tamerlane left a memorial to his stay in the Ulytau on a slab on Altynshoky mountain in spring, 1391. Numerous sites of primitive peoples and their implements have been discovered here by archaeologists. One the largest workshops of the paleolithic era in Kazakhstan was found on the banks of the Karakengir river. In all river valleys, bronze age monuments and settlements, necropolises, and royal graveyards of the Begazy-Dandybayer culture have been revealed. The mystery of the so called "barrows with whiskers" refuses to be unraveled to this day. Some people consider them tombs, others believe they are ancient observatories, and a few - that they form a ritual complex. Archaelogical excavations inform us that the native tribes were engaged in mining and metallurgical affairs as far back as 1000 BC, and they exported copper, tin, silver and gold to Iran, India, and Greece, as Heroditus, the "father of history" mentions. Ulytau has been called a "country of lakes and springs". The healing characteristics of Ulytau mountain spring water are known in far away regions. European and Russian ambassadors visited to recuperate in the Ulytau spring water, while they were making their way to Karakorum, the main headquarters of the Mongols.